The year was 1939. Franklin D. Roosevelt was president. A gallon of gas cost 10 cents, the average price of a new car was $700 and names like Harlond Clift, Red Rolfe, Jimmie Foxx, Lefty Grove, Bob Feller, Bobo Newsom, Joe DiMaggio, and Ted Williams were at the top of Major League Baseball's leader boards. And in Rochester, Minnesota, a young man named Robert Tierney was playing second base for the city's American Legion baseball team when he crossed paths with another of the game's all-time greats: The Iron Horse himself, Lou Gehrig. At the time, Tierney was "a teenager with a bad leg and no thumb on his throwing hand," according to a 2012 story by SDUncoverd.com. Gehrig had recently been diagnosed by doctors at Mayo Clinic with amyotrophic lateral sclerosis, or ALS, the incurable disease that would ultimately cost him his playing career, and later, his life. As the story goes, Gehrig spent time in Rochester while his diagnosis was being confirmed, and then again during a follow-up visit. And between appointments, he'd take his mind off of things by walking over to the same Soldiers Field baseball diamond where Tierney and others spent much of their summer. "We’d beg him to play catch with us, and he took to me because I was so gimpy,” Tierney tells the newspaper. Not only did Gehrig play catch with him, he also signed the ball and let Tierney keep it. He says that game of catch (and the gift of the ball itself, we'd imagine) "turned out to be one of the highlights of my life, really." In 2014, after caring for it for 75 years, Tierney sold the ball to Rochester residents Andy Chafoulias and his daughter, Taylor. They, in turn, donated the ball to Mayo Clinic, where it's now part of the Mayo Clinic Archive and historical collection. Anthony Windebank, M.D., professor of Neurology and director for Discovery in Mayo's Center for Regenerative Medicine, says the ball is more than just a keepsake from one of the sport’s greats -- it’s also a symbol of Mayo's long-standing history as a worldwide leader in ALS research, diagnosis and treatment. 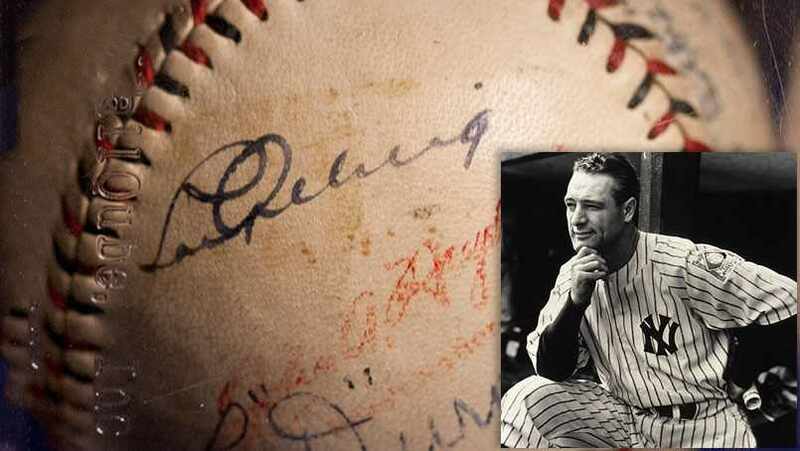 "This was in the late 1930s and already Mayo Clinic was known especially for its expertise in diagnosis," he says, adding that having the signed ball at Mayo “really closes the loop in some ways on Mr. Gehrig’s time here as a patient and as part of the Mayo family." You can see the ball (and many other featured exhibits) yourself next Thursday, July 23, during a Mayo History Open House from 4 p.m. to 8 p.m. on Mayo's Rochester campus. If you miss it there, you can catch it (pun intended) when it moves into its new home in Heritage Hall in 2016. Step up to the plate and share your comments below. You also can share this story with others using the social media tools atop this page.